1. Thailand: - This is one of my most favorite countries, where I like to spend my holidays with my near and dear ones very frequently. Without any doubt, Thailand is a destination that will leave a lasting impact on your mind. The top reason of visiting this country is affordability. It comes with affordable price tag. Where else would you find hotels offering deals like "stay 20 nights and pay only 10" or "stay 10 and pay only 5"? It is not like; this deal comes once in a while. Another reason of spending holidays in Thailand is a blend of everything. It is a mixture of golden beaches, natural scenic beauty, cosmopolitan culture, mouth watering delicious food and places of religious significance. I would definitely say that a tour to Thailand would be incomplete without a visit to the city of Pattaya which is famous for its activities such as paragliding, snorkeling, water sports, etc. 2. London:- Blessed with all the worldly pleasures of the globe, London is one of the most beautiful country that has something for all. From pristine beaches to rich cultural beauty of heritage, the country has all of them to keep you cheerful and engaged. London is well known for its retail therapy. There are so many streets and areas which are best considered the crème de la crème for retail therapy, these includes, carnal street, regent street, Covent garden, kings road and oxford street. These are some streets where you get what you need. There is so much to see in London such as Buckingham Palace, Big Ben, The London Dungeon, St Paul's Cathedral, Tower of London, Covent Garden, Shakespeare's Globe, Ripley's Believe It Or Not, Madame Tussauds, London Aquarium, London Bridge, The London Eye and Westminster Abbey. 3. New Zealand:- New Zealand is the place to visit if you want to have the time of your life. This is the country which makes you fascinated with its wonderful sceneries. With scenery to thrill and excite the senses, this country also well known for its excellent local production, concerts and music. Let me begin with adventurous activities that you can experience in New Zealand, 1) Bungy jumping, 2) Glacier walking, 3) Jet boating, 4) River rafting, 5) Skydiving. Heart Pumping? Yeah!! 4. Mauritius:-Whether you like thrilling adventure tour or restful vacation, Mauritius is one of the countries where you’ll find a wide number of options to guarantee the vacation of a lifetime. Being known as seducing paradise on earth, Mauritius is a blend of various religions, cultures encompassing of Hindus, Tamils, Muslims, Creole, Chinese and European who respect each other and love to enjoy diverse ways of life with different customs and traditions. Go for it! 5. Singapore: - Singapore is another most popular destination to spend holidays, which has a lot to give you much pleasure. Being known as the smallest country in Southeast Asia, it is packed with inherent charm and adventure sports. There are many attraction and activities that you surely cannot miss. It includes: sky tower, dolphin lagoon, sentosa merlion, images of Singapore, songs of the sea, fort siloso, underwater world, jungle breakfast, Singapore flyover, night safari, and Singapore zoo .The list goes on and on. 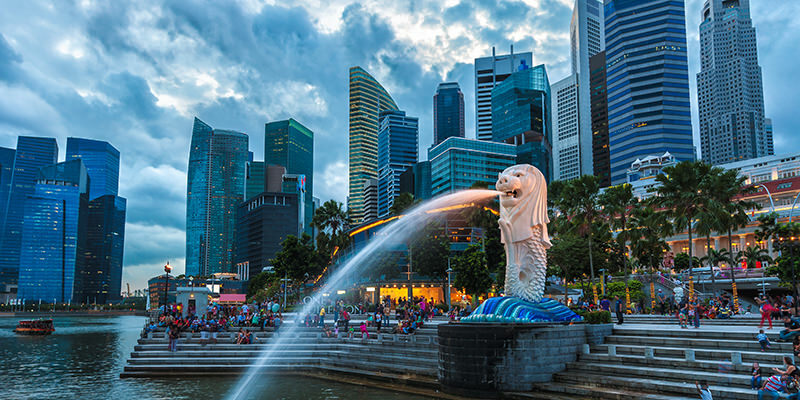 Do not think much; just book your Singapore holiday packages today. If you have never been to the above mentioned destinations, recommended are the perfect countries for your trip of a lifetime. Fly to these countries today and get ready to be amazed!